ATLANTA (AP) — In a frantic search by phone and on foot, volunteers have been trying to find ballots that could help Democrat Stacey Abrams close the gap against Republican Brian Kemp in Georgia’s unresolved race for governor. 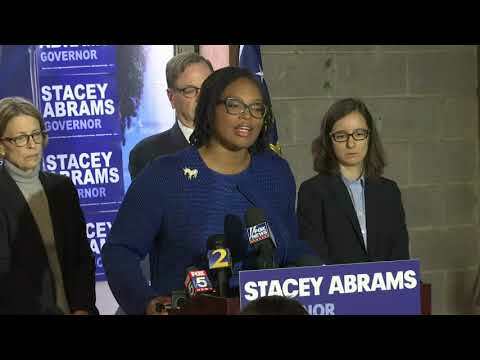 Yet Abrams, who hopes to become the nation’s first black female governor, sent out volunteers and campaign staff in search of votes that she hopes could still tilt the margin toward her. The goal was to reach voters who used a provisional ballot to make sure they take steps to ensure their vote was counted by Friday evening, the deadline. It wasn’t clear whether the effort paid off, but a majority-black county with more than 750,000 residents in metro Atlanta, DeKalb, said it would remain open past normal hours for provisional voters who needed to provide identification so their votes could be counted. The story was different elsewhere. Two groups supporting Abrams’ call to count all votes, ProGeorgia and Care in Action, said at least 12 other counties had certified election results before Friday, a move that could leave provisional ballots uncounted. The secretary of state’s office did not immediately respond to an email seeking comment. The New Georgia Project, which Abrams founded, had volunteers fanned out across the state looking for provisional ballot voters ahead of Friday’s deadline. Besides knocking on hundreds of doors, the group was coordinating with black radio stations, flooding social media and texting hundreds of thousands of voters who might be wondering about provisional ballots. In a warehouse-turned-phone bank near downtown, dozens of volunteers converged to make phone calls to voters who used a provisional ballot. Returns show Kemp with 50.3 percent of almost 4 million votes, a roughly 63,000-vote lead over Abrams. The difference is enough for an outright victory if total totals remain the same, but it’s a narrow sum, considering the large turnout.